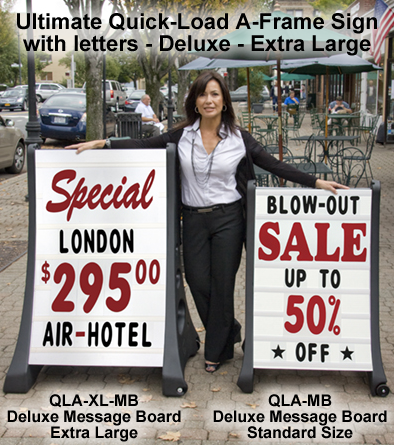 36"(w) x 30"(d) x 50"(h) QLA™ Rolling, changeable sidewalk/curb Message Board sign with 2 - 6 line 28" x 44" white sign faces with 5" characters. 2-sided. Fast assembly. 2 - 28" x 44" x 0.5" (600 x 900 x 10mm) white sign faces with letter tracks on both sides. 1 - set of 24 - 10" jumbo numbers plus % (Red).